On this day in 1886, the typewriter ribbon was patented. Typewriters. Wow--that's a blast from the past! 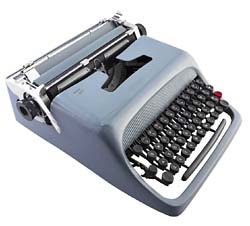 Some people still do use typewriters, but mostly the typewriter is a relic from a not too far gone era. Remember Wite-Out? Carbon paper? How cool is it to just backspace over your mistakes and use a Xerox machine to make copies? Speaking of watching movies at home, remember popcorn makers? Back in the old days (I may be the only one who remembers this far back...), you poured some oil in a pot, added in some popcorn--just enough to cover the bottom of the pot--and let it heat up. When the first kernel popped, you covered the pot with a lid and then moved it back and forth over the burner so the popcorn wouldn't burn. Of course it always did. Sometimes we got Jiffy Pop which created this great big aluminum bubble as it popped. But eventually we got a--drum roll please!--electric popcorn maker. You still put the oil in the bottom and added in a little popcorn. But it had an automatic butter melter thingy (note scientific terminology) which consisted of a cuplike structure in the top of the plastic lid. You put a chunk of butter in it and snapped a lid over it. The you put the plastic lid over the base. As the popcorn popped, the butter would melt and drizzle out through hole in the lid on top of the popcorn. Well, that's the way it was SUPPOSED to work anyway. Usually the lid fell off and the chunk of butter plopped in one giant lump on top of the popcorn. But it was really fun to watch--almost more entertaining than the movie! After that it was an air popper--which didn't require oil and was supposed to be "healthier." Unfortunately air popped popcorn tastes like styrofoam packing peanuts. But then came microwave popcorn! Who invented this stuff? It's genius! Good-bye popcorn makers, hello Orville Redenbacher! Portable CD players. Who needs to lug around a player and the CDs now that we have iPods? And while we're on the subject, CDs are also quickly becoming a thing of the past as well. As more and more people start to prefer the ease of iTunes and mp3 files, those sweet little jewel cases are just going to gather dust. 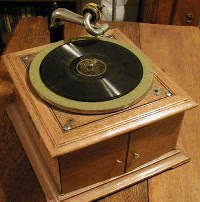 Along with the disappearance of vinyl records, stereo systems have become a thing of the past. And even our old boom boxes are a quaint reminder of another era. Now we have speakers on our computer and a BOSE docking station for our iPods. Woofers? Tweeters? Equalizers? We need that space for our high-def home theater systems! Land lines. Now that everyone has a cell phone and DSL, home telephones are fading into oblivion. And your local phone company knows it and is scared. Hence the bundled services and junk charges. Verizon tried to charge me $2.00/month for NOT using long distance. Then when I called to have them take off the charge and make it so it wouldn't recur, they said it would cost me $7.00 to do that. Naturally I complained and they ended up waiving both charges. With fewer and fewer people having land lines, there is less need for that marvel of modern technology--the answering machine. We've got voice mail instead. And you also see fewer and fewer payphones as well these days...And phone booths. When was the last time you saw a phone booth? Rakes. Now this is one I really miss. The stupid noisy leafblowers are the bane of human existence in my opinion. It's such a guy thing to have a ear-splitting, engine-operated way to blow stuff around. Hopefully the green trend and the push to reduce carbon emissions will bring back the rake and the push broom and the manual little rotary mower. Ah, the sweetness of silence at 7 am! And then there's 5 1/4 floppy disks which were replaced by 3 1/2 floppy disks which have been superseded by CDs which are being phased out by flash drives. For all the things that have become or are on their way to becoming obsolete, there are still some low-tech things that I think will stick around a little longer. 1. The Sunday paper - Sure you can get your news online, but nothing beats spreading out all over the bed with the Sunday paper. It's certainly not as much fun to read the comics off a computer screen! 2. All paper in general - Talk of the "paperless" office has been going on for over 20 years. Yeah, right. Even with online billing and online banking and choosing "no" when the gas pump asks if you want a receipt, we're still drowning in paper. Paper--invoices, spreadsheets, memos, e-mails printed out, grocery lists, directions, business cards, etc.--is here to stay. 3. Brick and mortar stores - Online shopping is quick and easy--no crowds, no lines. But sometimes we need to see, feel or even smell something before we can buy it. B&M satisfies not only our need for the tactile experience, but instant gratification as well! 4. The US Postal Service - Yeah, they've had competition from e-mail, UPS and FedEx. But the USPS still delivers over 200 BILLION pieces of mail each year and posts almost a billion dollars in net income. I like your posts. Very well written. LOL!!! I completely forgot about 8 tracks. Geez--they bit the dust even quicker than albums, huh? I remember my Dad had an 8 track player installed in our station wagon (another almost obsolete thing what with minivans and SUVs) to listen to tapes on road trips. Lots of Simon and Garfunkel and Burt Bacharach. I may have been the only 11 year-old who knew all the lyrics to "Do you know the way to San Jose?"